The Appalachian cottontail is very similar in appearance to the eastern cottontail. In fact, it can be very difficult to distinguish between the two species. The eastern cottontail is somewhat lighter in color. Also, it often has a white spot on the forehead. The Appalachian cottontail rarely has a white spot, but usually has a black spot between the ears. The Appalachian cottontail is also somewhat smaller. At one time, the range of the New England cottontail (Sylvilagus transitionalis) was thought to extend from southern Maine through the Appalachians to northern Alabama. However, biologists now consider individuals from the southern portion of the range to be a separate species, the Appalachian cottontail. The Appalachian cottontail is generally restricted to the Appalachians and has a patchy distribution that extends from Pennsylvania to northeast Georgia. In Virginia, the species is found west of the Blue Ridge Mountains. Little is known of the predators and diseases of this species, but they are assumed to be similar to those of the eastern cottontail. Little is known of the reproductive attributes of this species as well, but again they are assumed to be similar to the eastern cottontail. No studies have examined the food habits of this species. They likely rely heavily on herbaceous forages in spring/summer and more on woody vegetation during the winter months. The Appalachian cottontail is typically found at higher elevations and is associated with coniferous forests with dense ericaceous vegetation (members of the heath family) in the understory. 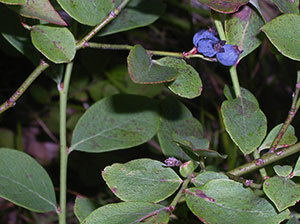 Ericaceous vegetation includes Vacciniums (such as the huckleberries seen here) and mountain laurel. The species may be found at more moderate elevations where suitable habitat exists. The Appalachian cottontail population in Virginia appears to be stable at present. However, there are threats to the species. The most important of these is urbanization which destroys its habitat. There is less information on how to manage for this species than there is for the eastern cottontail. The most limiting factor is the availability of suitable habitat, so protection of habitat is obviously important. They may also benefit from moderate tree harvesting. Clearcuts are not necessary to produce habitat for the rabbits. Thinnings that allow sunlight to reach the forest floor would greatly increase the quality of woodland habitat for Appalachian cottontails. However, creation of corridors of early successional habitat from areas occupied by eastern cottontails to areas occupied by Appalachian cottontails is discouraged. It is theorized that the former out competes the latter.